Inviting your mom/best friend/therapist on your date signals that you may not be ready for a relationship with another grown up. Inviting your passing-by comedian friend to your table while dining al fresco signals that you really don’t know any better. In both scenarios, awkward questions will ensue. Try not to spill raspberry margarita or anything red, brown or wet on your date. Flag the waitstaff for extra napkins. DO NOT pat down your date in a “helpful attempt” to dry them off. If your date lives close by, offer to drive/walk them to their place so they can change. DO NOT be creepy and invite yourself in. Wait in the lobby or on the porch. It should go without saying that showering before a first date is recommended. As is brushing your pearly whites. Studies show that people who smell good smell good. The key to good hygiene is to do it at home. DO NOT pull out your dental floss at table and begin to floss. Not even if you just bought and paid for two steak dinners with corn on the cob. Excuse yourself and check your floss-loving face out in the lavatory. If you must, discreetly use a toothpick to get them there meat bits out yer gob. Asking your date how they would like their eggs in the morning is one way to increase the likelihood of #2 intentionally happening to you. If you’re looking for a long-term relationship, play it cool and you’ll have a chance to role-play the TSA pat down soon enough. Unless this is a first date with someone you’ve known for years and they already know your neurotic tendencies and still agreed to go on a date/ask you out, posting a selfie of you and your date during dinner on Instagram using the “Apollo” filter and using hashtags #havingfun #OMGHesTheOne may freak your date out. As long as you’re complimenting your date. Ogling the waitstaff or other patrons is not cool. Especially when you hit them up for their telephone number or mime the classic “call me” with the old school thumb and pinky sign. P.S. Saying “It must have taken you forever to look that good” is not a compliment. 9. DO pick a location that is first-date appropriate. Choosing the right place needn’t be stressful. A place with good lighting and is relatively quiet encourages conversation. Meeting for coffee, while cliché, can end up turning into lunch, dinner and dessert. It can also end up as just coffee. You’ll know soon enough if your date is grande interested in you or just lattes in general. Another great first date is playing mini golf. Unless your date has an irrational fear of windmills. 10. 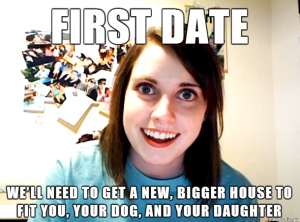 DON’T take your first date too seriously. It’s not like you brought the current IKEA catalogue with you, with colored index tabs marking your favorite items and your plan for increased feng shui in your new apartment together, right? Right? You may want to rethink your conversation skills/ personality /medication. This entry was posted in advice, blog, comedy, first date, relationships, romance and tagged advice, coaching, comedy, first date, relationships, romance. Bookmark the permalink. Am I ever glad I am not on the dating scene anymore! LOL Great tips.